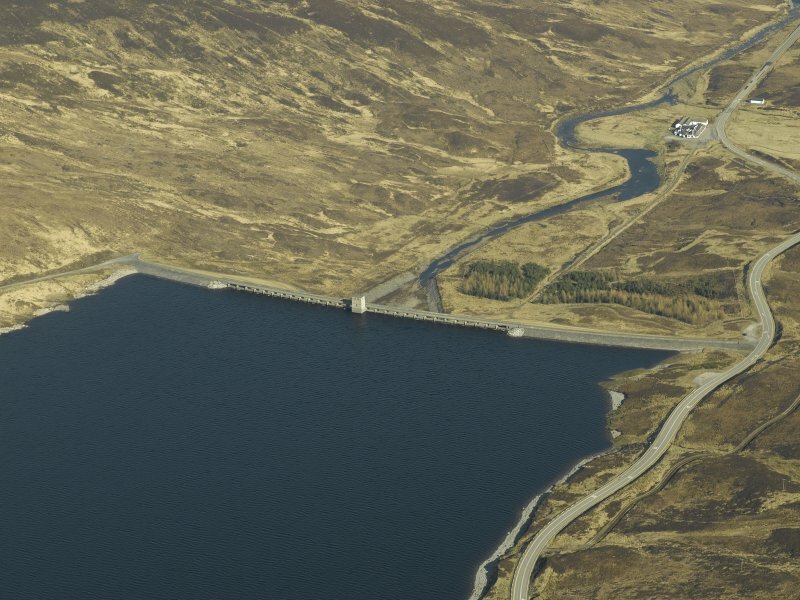 Oblique aerial view centred on the dam and electricity generating station with the hotel adjacent, taken from the W.
General oblique aerial view of Loch Glascarnoch centred on the dam and electricity generating station with the hotel in the foreground, taken from the SE. Glascarnoch Dam Urray, Ross And Cromarty, Scotland. Oblique aerial photograph taken facing North/West. 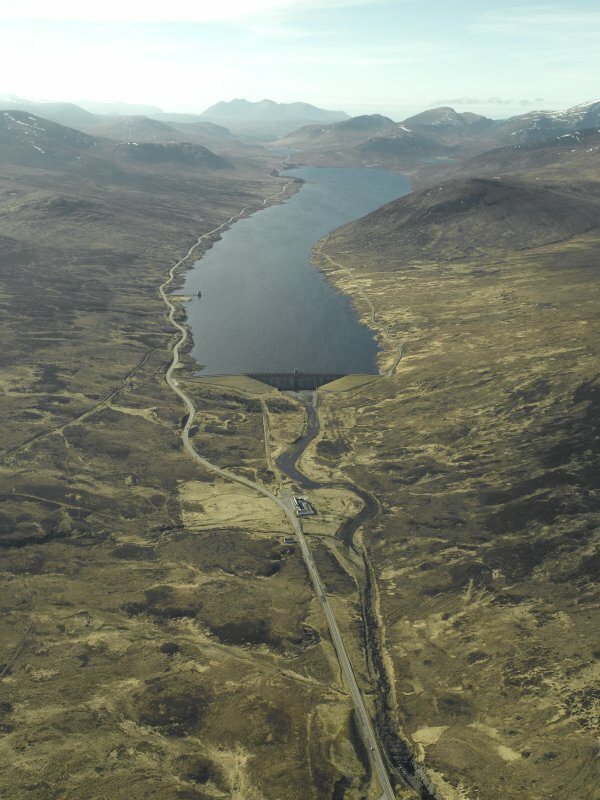 General oblique aerial view of Loch Glascarnoch centred on the dam and electricity generating station with the hotel in the foreground, taken from the ESE. Oblique aerial view centred on the dam and electricity generating station with the hotel adjacent, taken from the WSW. 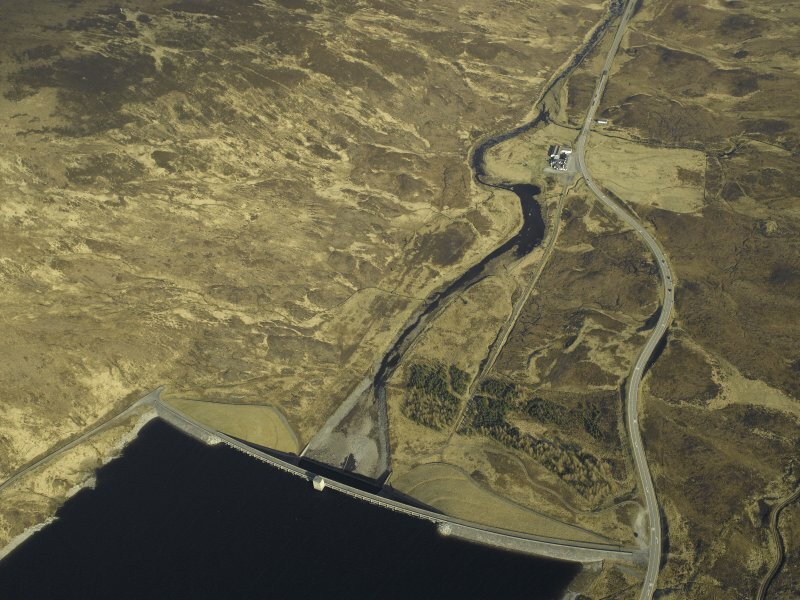 Oblique aerial view centred on the dam and electricity generating station, taken from the SE. 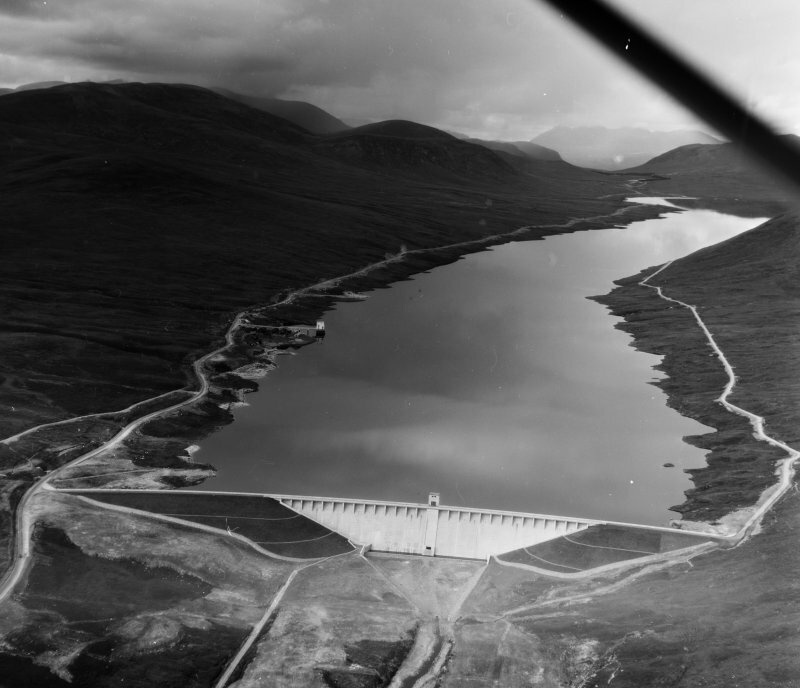 This dam is from the second phase of development on the Conon scheme, which included two dams and two power stations. 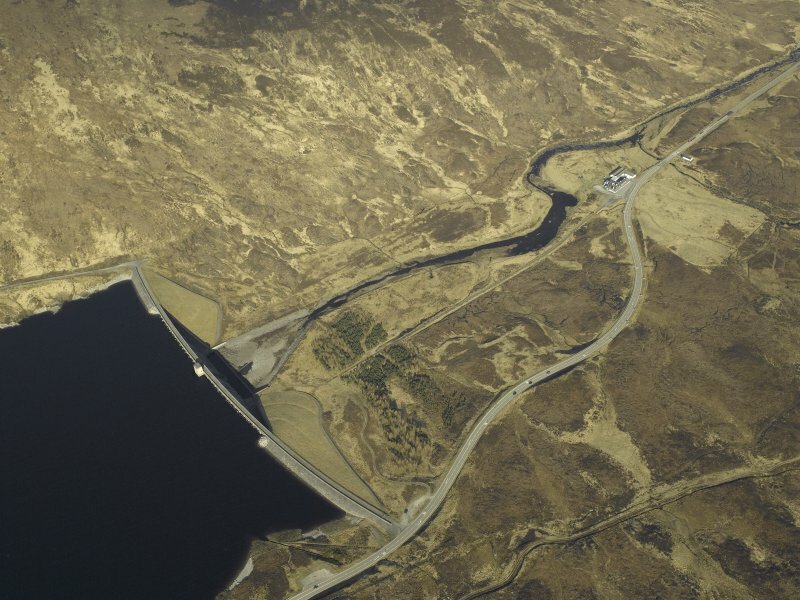 Glascarnoch dam receives water from the two other dams at Loch Droma and Loch Vaich (see separate items) and provides flow regulation and storage capacity for Mossford power station (see separate item) to which water flows through a 8km tunnel the inlet for which is upstream of the dam on the southern banks of Loch Glascarnoch. The dam has a fixed spillway to the centre with a roadway oversailing on slender concrete piers. A needle valve to the base of the dam is controlled by the central tower. 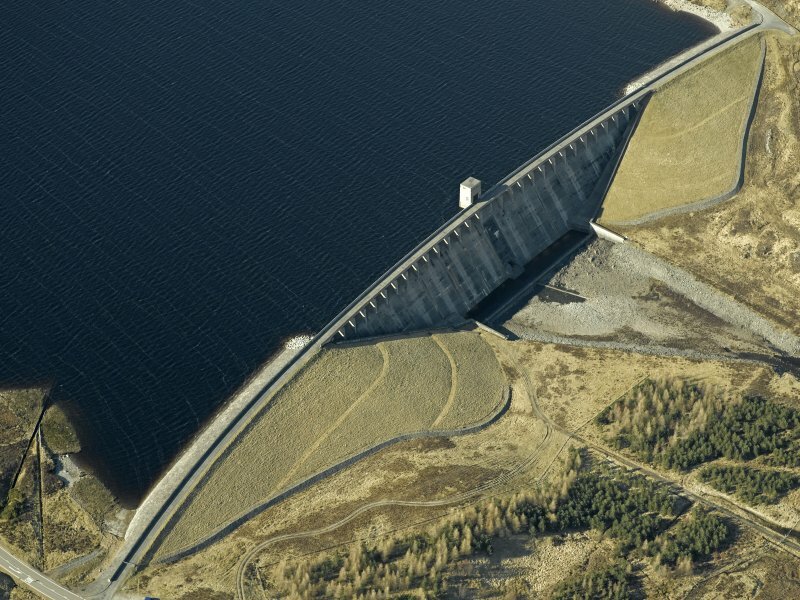 The dam is composed of two flanking turfed gravity sections and a central arch section. 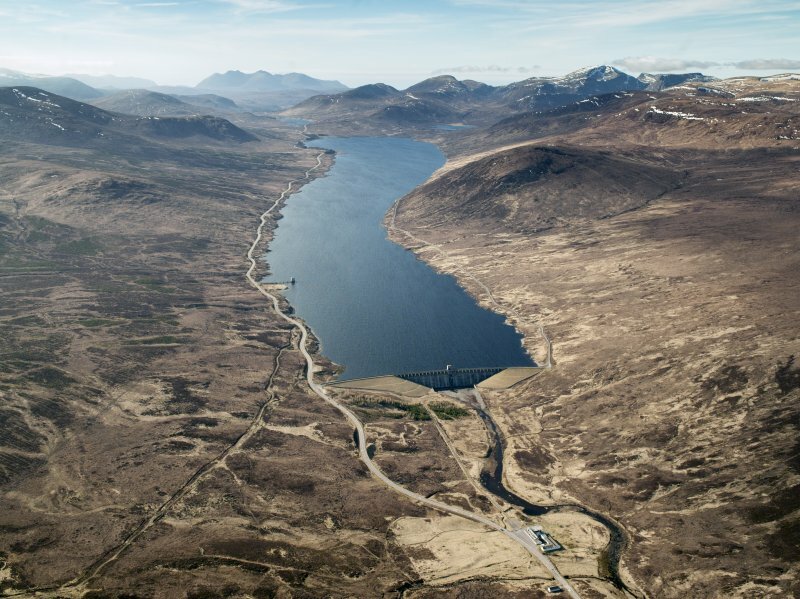 This dam occupies a very prominent position adjacent to the main A835 road to Ullapool. The dam is a dominant in the landscape situated at the top of a small rise and towering over the Aultguish Inn which lies beneath it. National Archives of Scotland (NAS), Ref: NSE North of Scotland Hydro Electric Board Collection (1943 -1990); NAS, Ref: NSE1 North of Scotland Hydro Electric Board Minutes (1943-1990); NAS, Ref NSE2 North of Scotland Hydro Electric Board Annual Reports (1943-1990); PL Payne, 1988; J Miller, 2002, 92; Scottish Hydro Electric, 2000, 10.